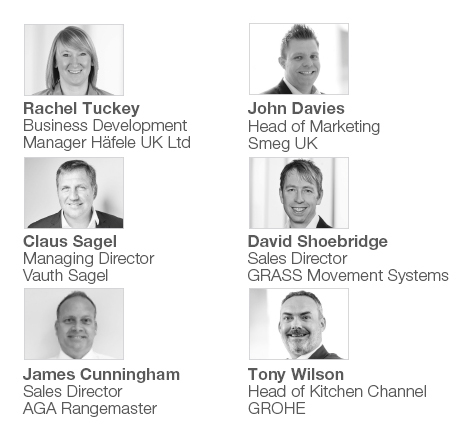 In our previous Ask The Experts feature, our partners from GRASS, Smeg, GROHE, Vauth Sagel and AGA Rangemaster, as well as our Business Development Manager, Rachel Tuckey, gave us their expert view on the kitchen trends that are shaping the industry. In this feature, the experts provide their advice for how kitchen designers can address the ever-developing challenges in kitchen design. How important is thinking ahead when designing a new kitchen? John: We always ask homeowners how they currently use their space and how they want to use the space in future. Do they have a large family? Do they regularly entertain? How important is capacity? Do they need to factor in storage? All of these elements will have a big impact on design and layout. James: A kitchen always has strong associations with a homeowner’s lifestyle. Consequently, the space needs to work in 5 or even 10 years’ time, when lifestyles may change; perhaps adapting for a growing family or spending more quality time with friends. Rachel: Another aspect of thinking ahead is technology, as it becomes increasingly prevalent in our everyday lives, and the kitchen is where some of our most expensive tech purchases can go! 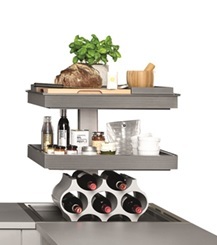 Building technology into your kitchen design is essential for modern kitchens. How are changing customer needs going to challenge designers in 2018, and how can manufacturers overcome this? 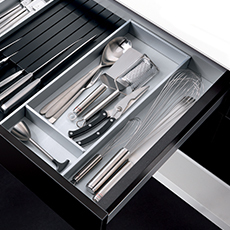 Rachel: Consumer demand for space-saving solutions is growing in demand, as the space we live in becomes smaller. Manufacturers will be challenged in both efficiency and functionality, and it is up to us as suppliers to offer them the toolkit they need to fulfil this demand. This is why we’re always looking for new products that offer flexible and surprising solutions, like the Ixconnect – which one Best of the Best at this year’s Interzuum, and the handy Ninka Qanto – which you may have seen at this year’s KBB exhibition! David: The need for individual design, whether that’s materials, colours, sizes, the list goes on, will make manufacturing more complex! However, using special touches to create the impression of personalisation, such as components, appliances, hardware and decorative ironmongery will give manufacturers the opportunity to achieve this. James: it’s important for to adapt quickly to customers’ feedback and requirements. As a UK manufacturer, Rangemaster is able to implement and deliver product updates quickly and effectively, satisfying customer demand and overcoming any challenges faced within the marketplace. What advice do you have for designers who want to be more ambitious in their designs? James: Always consider the alternatives. While brushed and polished finishes will always remain popular on kitchen appliances, coloured metallics, such as coppers or golds, are great options as they can offer an elegant contrast, or indeed make a design statement in a kitchen. John: And challenge the brief!! I believe design is all about making a space the best it can be in terms of being inspirational place to live, flexible to use, and of course affordable. 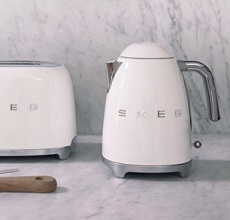 By experimenting with layout, design, aesthetics, materials, colours and formats, only then can the ideal kitchen be realised- with statement Smeg appliances at the heart of course! You can read the full Ask The Experts feature in What's New: The Spring Edit in our online catalogue or by ordering your copy for free. Click the link below for insight into the latest kitchen trends from the experts.